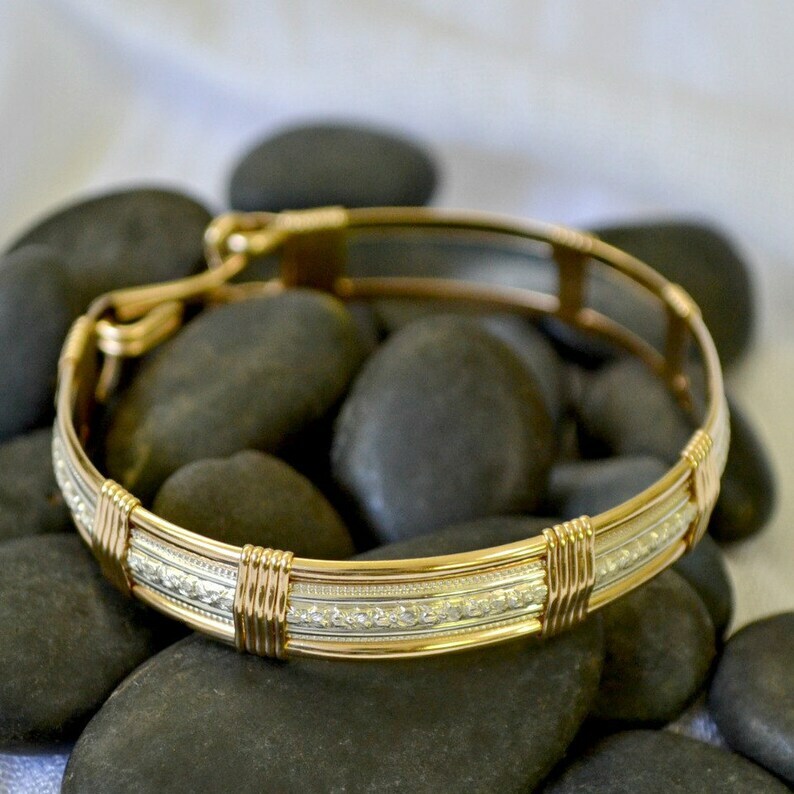 The Cosmopolitan Bracelet is handmade with 925 sterling silver and 14K gold filled wire accents. It is easy to clasp and unclasp with a gentle squeeze of the hand. Weighs just over 6/10th ounce or 19 grams. I CAN make sizes smaller than 6.5 but if you choose that size, please be aware that any return will incur a 15% restocking fee. For sizes not shown, contact me for a custom listing. "Cosmopolitan" meaning: "Familiar with and at ease in many different countries and cultures. To measure your wrist, measure it snugly (but not tight) just above the wristbone. narrow painters tape inside-out works well. Then lay it flat next to a ruler. Add 3/4 inch (19mm) to get your bracelet size. Wire wrapping uses no solder or glue and begins as a simple piece of wire. Love it! I wear it all the time. I’ve had it over a month, and although I probably shouldn’t, I shower and exercise with it on and it hasn’t tarnished or faded. Will definitely buy from this shop again! Adjustable ring 14K gold filled or sterling silver. hand made. "totally twisted"